Seoul has signed a friendship agreement with the Canton of Zurich, Switzerland, to cooperate in e-government, science, technology, culture and tourism. Switzerland is emerging as a blockchain powerhouse recently after thriving on finance for long. 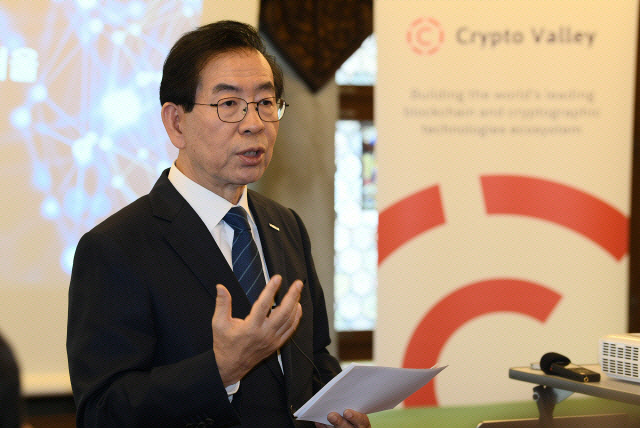 Seoul Mayor Park Won-soon, who is now on a 10-day trip to Spain, Switzerland and Estonia, met Thomas Heiniger, governor of the Canton of Zurich, Thursday and signed the pact. The canton of Zurich, northern Switzerland, is the global center of commerce and finance and has a population of about 1.5 million. “The friendship pact will pave the way for Seoul and Zurich to boost exchanges and cooperation. We hope to expand the sharing of policies as Seoul is ready to take off as a blockchain city,” Park said. Heiniger said, “Seoul’s get-together with Zurich is the best. The two cities are eager to find best policies to produce innovative results and help citizens enjoy more leisure time,” adding that exchanges and cooperation between the two cities will result in new ideas and help bolster their positions. Before signing the friendship accord, Park met Corine Mauch, Zurich’s first female mayor, at the Zurich city hall. Mauch, who had served on the city council, was elected mayor in 2009 and has been assuming the post over the last nine years. She successfully ran for a third term in March this year. Mayor Mauch asked for Seoul’s cooperation in organizing the tentatively named “Zurich Meets Seoul” event to be held in Seoul next September. The city of Zurich has been hosting events for cultural and economic exchanges in such major cities as New York, London, Hong Kong and San Francisco since 2014. Next year’s event will take place in Seoul. In the meantime, Park visited Trust Square, a blockchain center located in Zurich. Established in April this year, Trust Square is designed to support blockchain-based startups and become a place where related seminars and international conferences are to be held. It has cooperative ties with Swiss Federal Institute of Technology Zurich, the global blockchain insurance consortium B3i, academics and entrepreneurs.